Sean McElwee has lived a rich extracurricular life. As a student, he played every sport offered, joined Cub Scouts, attended dances, and even dated a celebrity. Sean, who has Down syndrome, functions according to a combination of the “it’s easier to gain forgiveness than permission” principle and the Nike tag line, “Just Do It!” Who’s the Slow Learner? 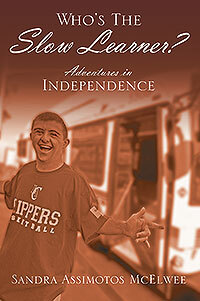 Adventures in Independence offers a series of poignant and often hilarious anecdotes about Sean and his parents as they support and facilitate Sean’s life skills education at home through extracurricular activities. Follow along as he learns housekeeping skills and money management and moves on through his transition program and community college classes. Sean’s antics will keep you smiling, while others may scare you as he exerts his independence—at times without his parents’ knowledge or permission. Riding the bus, creative spending sprees, dating, moving into a supported living apartment and back home, and obtaining his first paid job—these stories will both entertain and inspire. In this triumphant sequel to Who’s the Slow Learner? 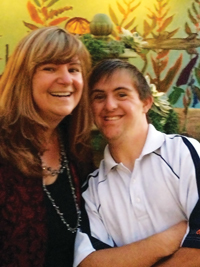 A Chronicle of Inclusion and Exclusion, we follow Sean’s journey to independent adulthood as his parents give him more freedom and responsibility while learning what he is truly capable of achieving. 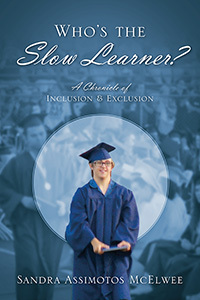 Sandra Assimotos McElwee is the author of Who’s the Slow Learner? A Chronicle of Inclusion and Exclusion and My Name Is Sean and I Have Something to Share. 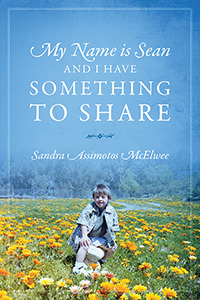 McElwee enjoys sharing the stage with Sean and presenting his story at speaking engagements. Sandra and Rick, her husband of 22 years, also enjoy traveling and participating in Sean’s sports activities. McElwee is a medical sales professional, but her most important job is being Sean’s mother.